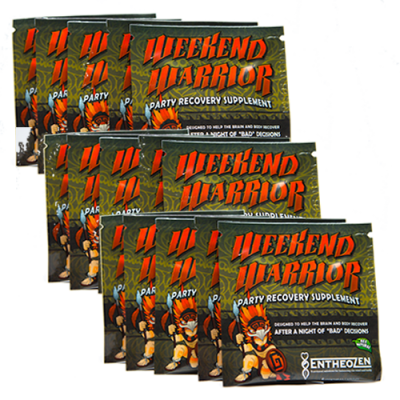 The most complete party recovery supplement on the market, Weekend Warrior is the perfect antidote for a night of “bad” decisions. 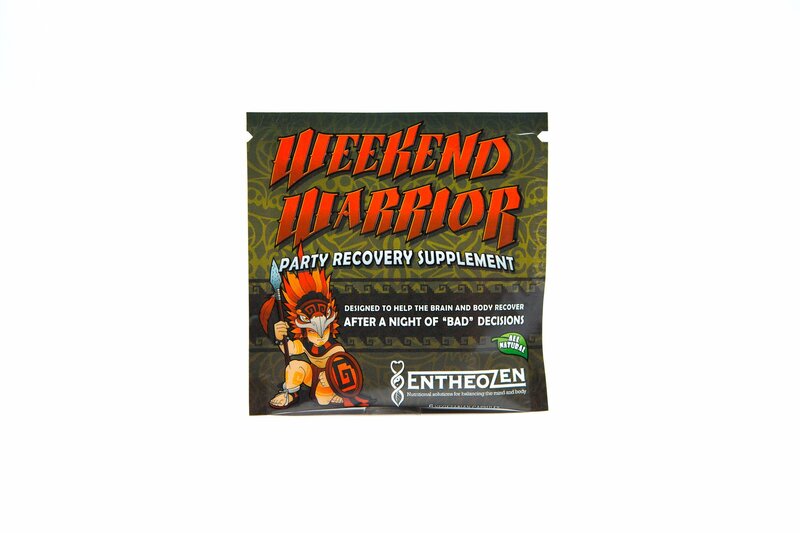 Whether is be a music festival, concert, rave, house party, weekend in vegas or night at the bar, partying can leave us feeling exhausted, moody, sore, mentally foggy and just a little off. Sleep deprivation, overstimulation, overexertion and use of alcohol, caffeine or other drugs can lead to oxidative stress, depletion of neurotransmitters, inflammation and damage to our cells. 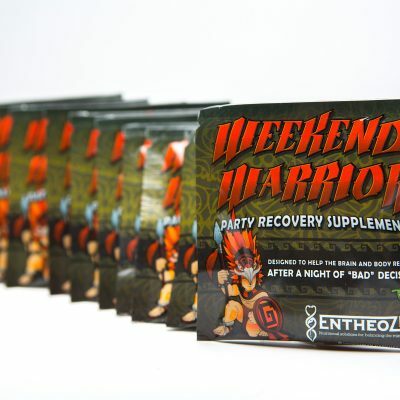 Weekend Warrior is here to help your brain and body recover after being pushed to the limits. It is sure to keep you feeling energized, sharp and happy even when the weekend is over. 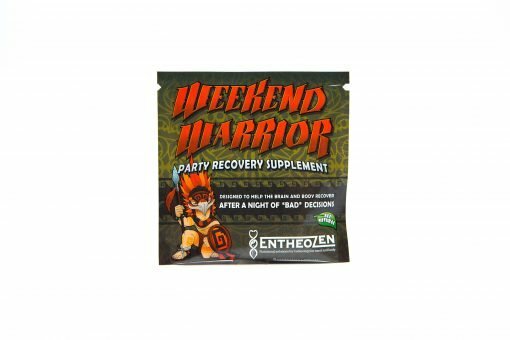 You no longer have to choose between having fun and feeling great! 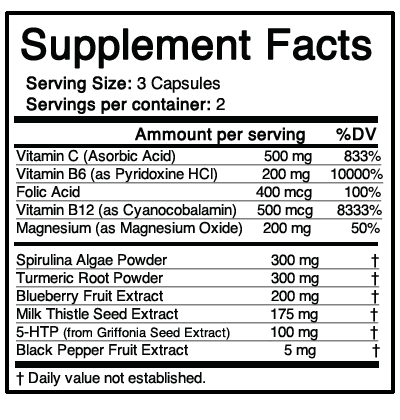 Oxidative damage to cells (free radicals). Atrophy and inflammation of brain tissue. Brain fog, exhaustion, pain, headache, and feelings of sadness or irritability. 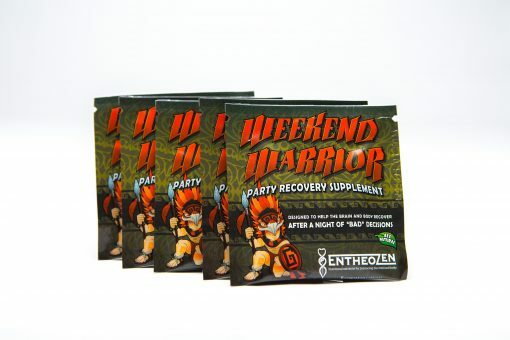 Attending a concert, festival, rave or other music event can have profound effects on us. 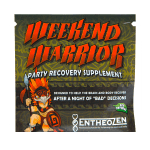 At EntheoZen, we believe that significant self growth, bonding and introspection can be prompted by the party experience. We want to provide tools to people to stay healthy and happy while on their quest for self discovery and human connection. We don’t think anyone should have to choose between having fun and feeling great. We are dedicated to educating, providing for and supporting a better world where people can be themselves and thrive. We found that the same concepts that apply to keeping a brain healthy and happy, also are useful in making sure a brain is resilient when put under emotional and physical stress. 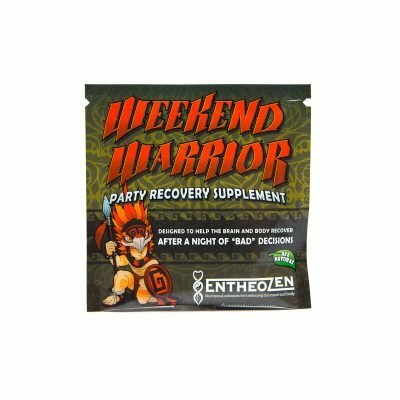 We have created our Weekend Warrior-Party Recovery product applying these key concepts of cutting edge neuroscience research. 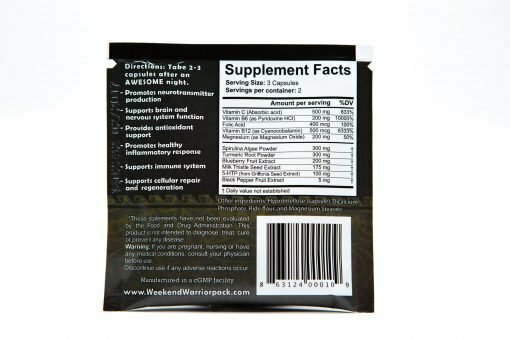 Filling in Nutritional Gaps- Providing the body and brain with nutrients that are fundamental for biochemical processes is vital for optimal wellness. Just as you need bricks to build a brick wall, you need the raw materials to build and maintain your brain tissue. In addition to correcting deficiencies, this includes providing precursors materials and enzymatic cofactors for the body to build neurotransmitters, proteins and neuronal structures such as dendrites, synapses and fatty cell membranes. 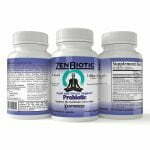 A brain that has the materials to repair it’s self is much more resilient to stress, toxins and environmental changes.